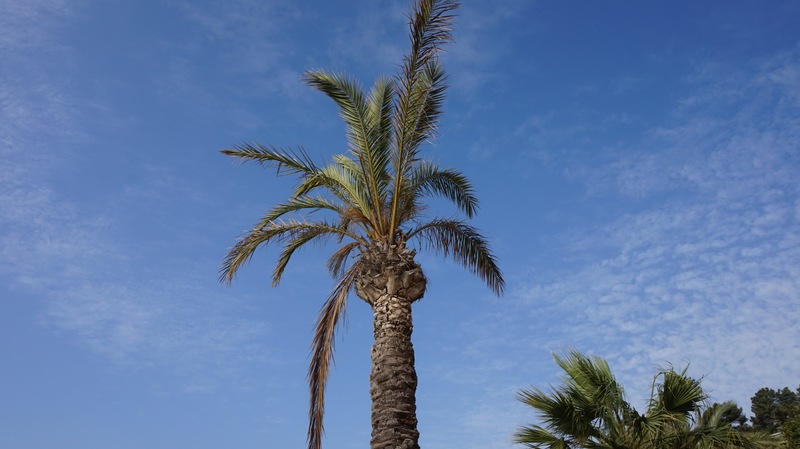 My holiday blues have yet to disappear but looking at photos of it has helped make the transition to grey weather better. Prior to going on holiday, I spent a reasonable amount of time shopping for holiday clothes. Since my wardrobe consists mainly of Autumn/Winter clothes (because let’s face it, UK weather will never get better) I had to get appropriate hot-weather clothing – also might have been an excuse to do retail therapy at the time – but anyway, I planned it a lot and after many discussions with my friends I finally chose the perfect outfits. By perfect I mean, they’d be comfortable for the weather and look pretty in photos. I’m no fashionista like some “fashion” bloggers but I do like to think I put clothes together well, I’m happy how these turned out anyway. You might’ve already seen these on Instagram as I was posting during the holiday. After arriving quite late to Spain, the reminder of the day was spent by the beach. 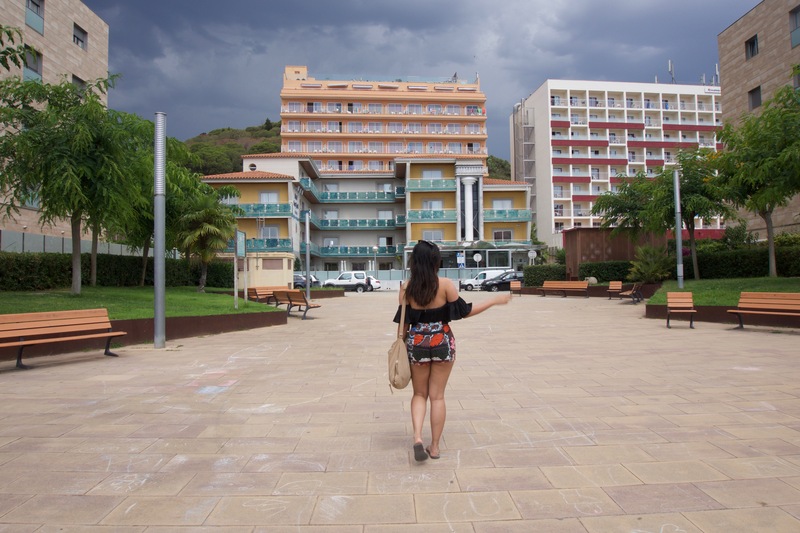 It was cooler than expected (it had just rained early that day) so no bikinis for now! 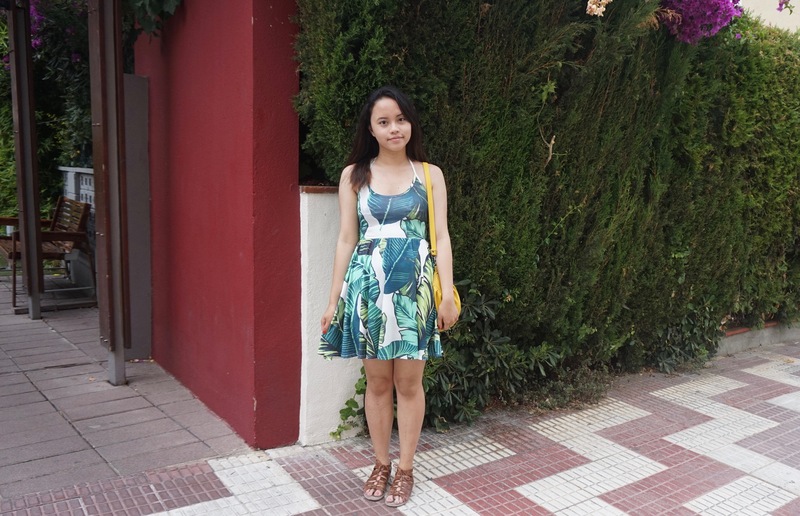 I opted in for this tropical halter neck dress from Missguided. A full beach day – mainly forced because we rented sun beds and umbrella for $15, I didn’t mind it at all though (much preferred!) Went for this cute playsuit from ASOS paired with my favourite H&M hat to date. It was much warmer than previously. I mostly wore this for lunch/walking around the hotel. Beach in the morning and city in the afternoon. 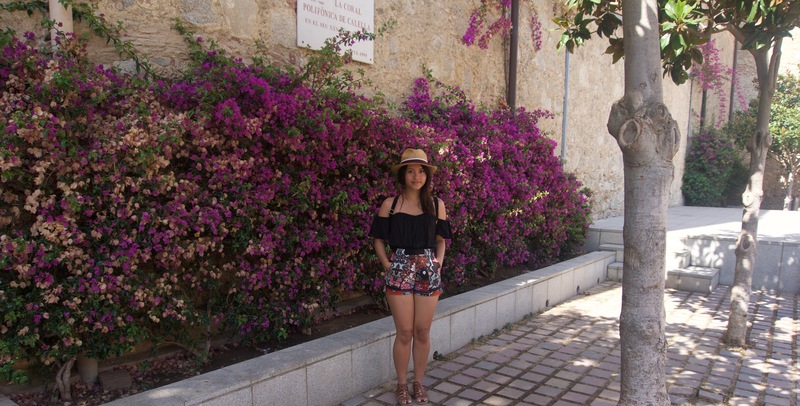 It got hotter as the day went on and my off-the-shoulder top and paisley shorts was perfect to keep cool. The shorts is a favourite of mine being high-waisted and having one of my favourite prints. Both are from River Island. The temperatures rose as days passed. 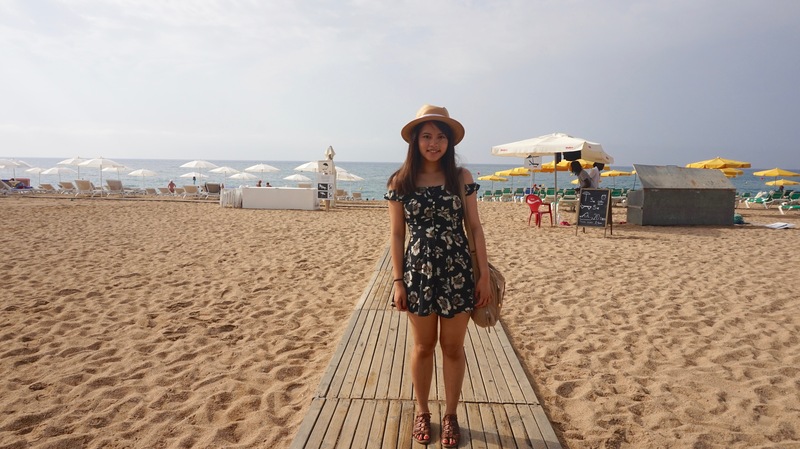 I spent my fourth day exploring Calella and on the beach again. This top was one I wasn’t that sure about when purchasing; it’s from H&M and is still available. I wasn’t so keen on it initially because the frills looked a little weird to me, I slowly adapted to it though – especially once paired with my favourite A-line skirt. First trip to Barcelona. 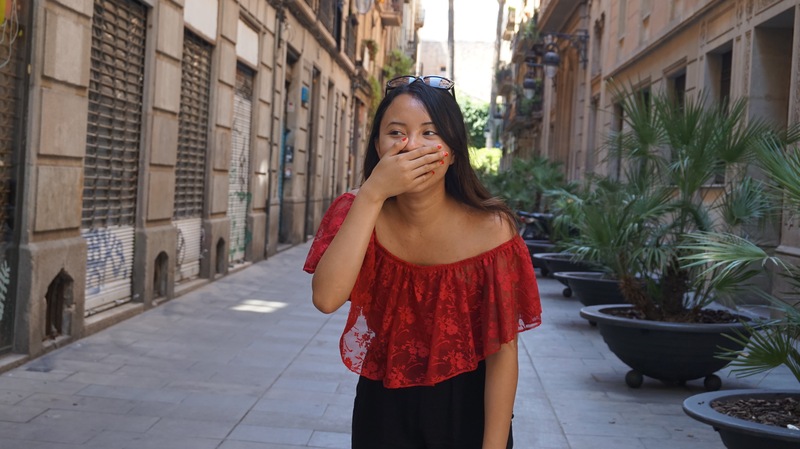 I purchased this off-the-shoulder floral lace top from Depop and fell in love with it instantly – I felt that the red gave off very Spanish vibes. I was initially going to pair it with my A-line skirt but since it was my first time using the train and metro to Barcelona, I didn’t want to attract too much attention; besides my black joggers were so much more comfortable and gave it a more casual spin. This ASOS dress has to be my favourite, it’s so elegant and incredibly comfortable. It’s actually an off-the-shoulder dress but I wrote it without the shoulder parts, I prefer it without though. 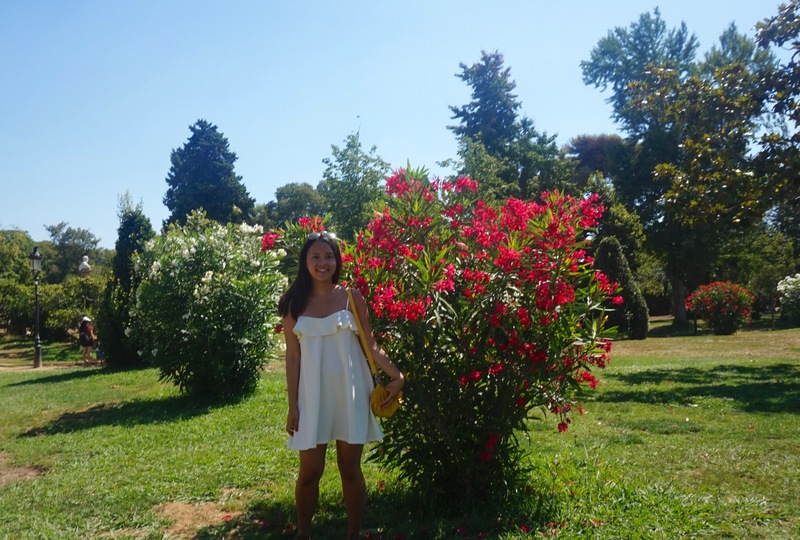 This day I spent exploring more of Barcelona, it felt great skipping around in this angelic dress that really showed off my tan. 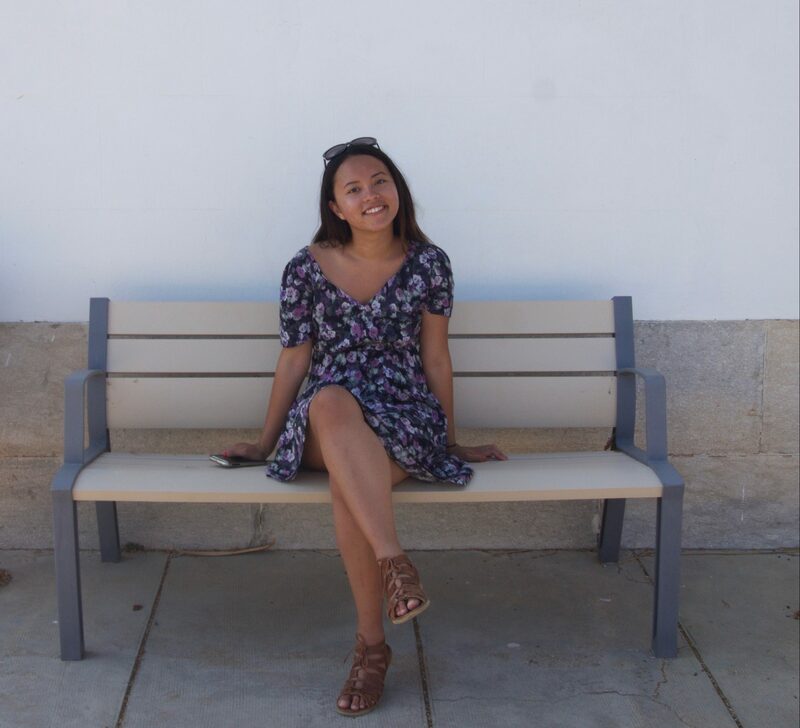 This was the day we hiked up the lighthouse, although this dress (from Next) was not ideal or typical for walking up steep hills, I loved how I kept cool and the fact it wasn’t sticking to me because it’s loose when I did get too hot. Purple is my favourite colour. And I love flowers. So, this dress was everything. It can be adjusted to be longer or shorter, I liked that because it made a great dress at the church where you weren’t allowed to show your ankles. Footwear: I didn’t change my shoes at all because I wanted to pack light, but these gladiator style sandals are from (of course) schuh‘s own brand. Similar ones can be found here. They are SO comfy, I even surprised my mom when I told her my feet did not hurt one bit from all the walking we did but hers did – she was wearing trainers too! I think one of the best parts of my holiday was to express myself through the clothes I wore. I can’t usually wear clothes like these in the UK (although I do try to sometimes and freeze to death) so it was fun putting them together. I enjoyed writing this post because I found it amusing to see how darker I become as the days progress. 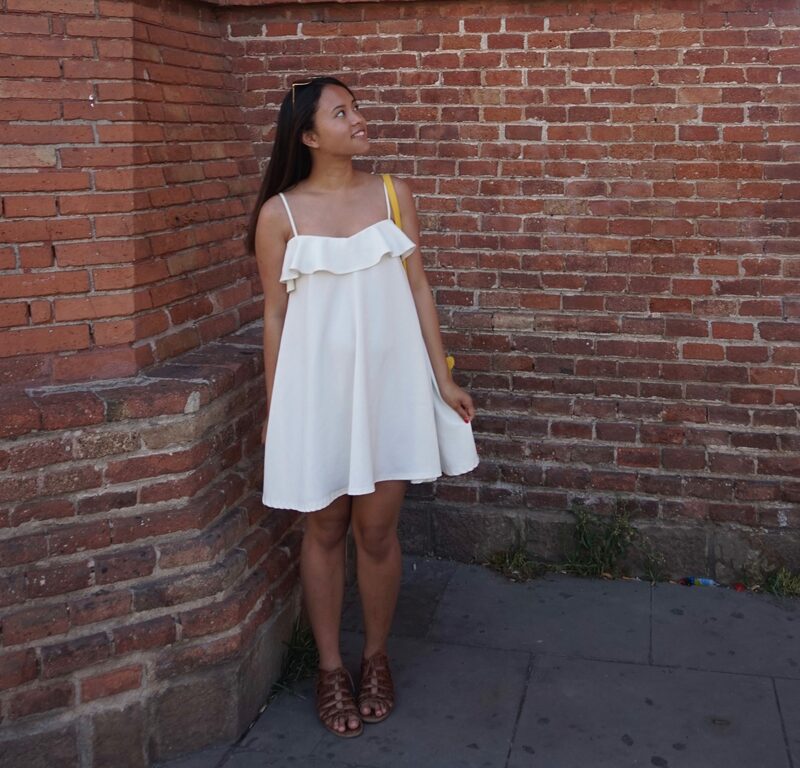 Hope this post gave you some sort of inspiration for your next holiday/summer outfits! Which is your favourite? All your outfits are so cute! I know that the off the shoulder look is the trend right now, so I like all the different ways you pulled it off~ I can’t seem to pull it off but it may just be more of a self conscious thing lol. I like all the different prints too! I love all of your outfits and you look absolute gorgeous in them! But I guess if I have to choose a favorite, I’d probably go with your outfit from day 2. Your hat and sandals work really well with your play suit and it looks you belong there. I’m not much of a fashionista. I was raised by my dad so I’ve never had someone who could critique me on outfits. So I mostly just go with jean shorts and t-shirts in the spring/summer with long sleeves and jeans in the fall (with a scarf in occasionally boots). Hopefully when money isn’t as much of an issue, I’ll be able to unleash my inner fashionista. Hey, you rocked all your outfits! Don’t worry about whether you’re a fashionista or not; you still look great ;). You don’t even need foundation. Your face is pretty and flawless as is!! For a hot weather, I stick to my short shorts and sleeveless top XD. Sunscreen is a must! I love your style! I would happily wear any of those outfits but I particularly love the white dress you wore on day 6. It looks perfect for hot summer days and it definitely shows your tan off really well. Pauline, all of your outfits are so cute! I think my favorite ones are the one with the red top on day five and the dress you wore on day seven. You do get that Spanish vibe with the red! But also love the white dress from day six! 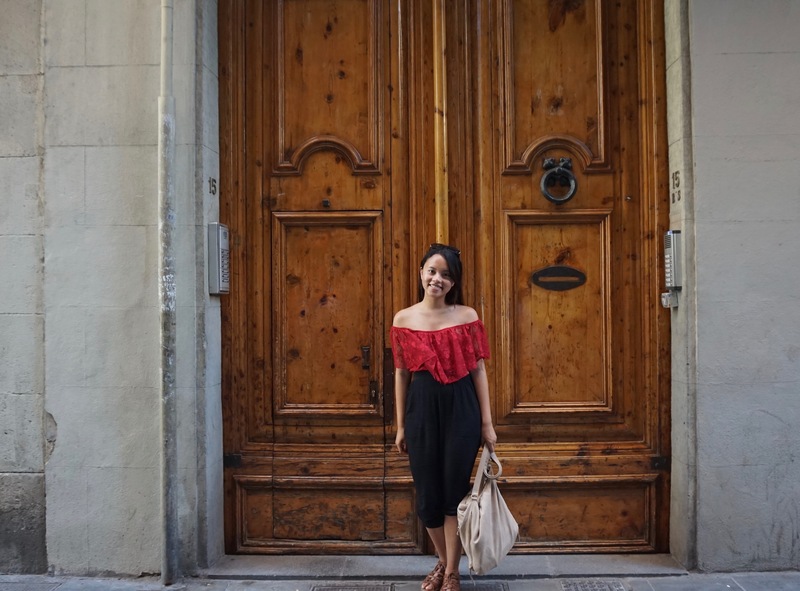 Whenever I’m on vacation, I usually just pack shorts and light shirts, so nothing too fancy, so I loved reading this post from someone who actually put effort into their outfits on holiday, haha! Such cute outfits! You have nice taste! And looks like a lot of fun! Also love the shoes! Lovely outfits, Pauline. You have a great sense of fashion! I admit, I’d never wear any of these clothes because I’m a prude and don’t like to expose anything but the lower half of my arms, but you rock these outfits really well! I think my favourite of them was what you wore on Day 5 and 6. You’re absolutely stunning in that red top (read just really fits you! ), and that white dress is so simple that it’s utterly elegant 😀 Beautiful outfits and photos, darling! I’m actually opposite with my wardrobe. Because of the hot Texas weather, I barely have winter clothing, so if I go somewhere cold, I have to buy new things! HAHA I was gonna do the exact same thing and write a post about what I wore on my trip to Mexico! I feel like trips are always a chance to switch up the wardrobe! Especially since I went to Mexico at the end of June when the weather here wasn’t so hot yet so it was a chance to wear all my new summer pieces which are now integrated into my wardrobe here (it’s so hot right now ahh). My favorite is def your ASOS dress, like you said it is just so elegant! I also really like your outfit on Day 5, though it’s not something I’ve tried! I don’t own joggers but they look so comfortable for summer and they go well with your off-shoulder top. I like your Day 3 & 4 outfits, they are nicely matched! You pull off floral dresses on your other days too. I bought floral dresses in Mexico for the first time but I’ve never worn them because they don’t fit in the culture here! Lovely outfits <3 Love the photos! I am going holiday shopping on Friday (because I get paid, haaa) and your outfits are giving me inspiration/life. "UK weather will never get better" = preach it, girl. I already have a few summer dresses that I'll definitely be taking, but I definitely want to get more. Oh, I love all of your outfits!!! But I do love winter and fall clothing, sadly I live in Texas and we don’t get much cold weather. But I’ve been getting into summer wear more this time. I actually bought skirts and sandals and I used to wear tights all year round…even in the heat!!! It was terrible. I loved this post so much! You may not call yourself a ‘fashion blogger’ but I think you have a sense of style that is cute and adorable. I love the flowy red top, that is probably my favourite. Not because of the colour (since red is my fave) but actually because of the style! And it looks great on you. As does the stripy blue frilly one. I will admit that that style doesn’t appeal to me much either. I am not sure how those off-the-shoulder tops look on me. Maybe I should try it some day. You look really tan in the photos from day 6 onwards. In a good way, of course. 😀 I came back from Europe looking all tanned… I am not a fan of being tanned, but I got over it hahaha.